I’ve been working on re-vamping my master bedroom. So far, it has taken me 7 years. I should be done pretty soon. I purchased a lamp for it, and it has sat on my side table (with the tags still on it!) for two months. I wanted to “fanicify” the shade somehow, and I just couldn’t make up my mind how to do it. But then…I saw this. However, I didn’t really see it until I saw this. That’s it! That’s how it needed to be fancified! Thank you, Terra from Mama Says Sew. She gives fantastic directions, but I’ll give you the low-down here as well. I folded the burlap in half and used my rotary cutter to cut the strips. Don’t let the ruler fool you. I didn’t measure anything. I just kind of “eyed” each strip, but I did use the ruler to make a straight line. I think they ended up being about 2 1/2 inches. Per Tessa’s directions, fold the strips in half and iron them down. 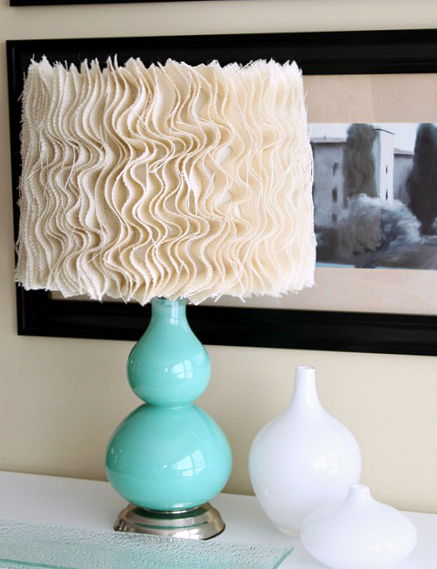 You will line the folded edge with hot glue and place it on the shade in a squiggly manner. Do this for about three days, burn your fingers five times, and itch for hours because of all the messy burlap residue. Once you’re done, you’ll have something like this! Unfortunately, I don’t think the base is staying this color, but it certainly is pretty! It was just the texture I was looking for, and it only cost $2.99 to do it. Inspiration abounds in blogland, doesn’t it? So cute! I just got new white lampshades for my bedroom and need something to dress them up a little. I was thinking just some ribbon but maybe I'll do this instead. Love this! And please oh please keep the lamp color. Gorgeous! Although I might shed a tear when you paint that lamp base, it's gorgeous too! Love this! I am kind of burlap crazy right now. Made some curtains and a pillow out of it. It is such a great material isn't it?! Awesome! I love a beautiful project like this where I can bring out the glue gun instead of a sewing machine! Love the lamp. I'm the queen of leaving tags on, and burning myself with the hot glue gun. Thanks for the great tutorial. Great job! I want one too… You did such a good job…I'm inspired! Oh how lovely!! What a great addition to your bedroom. Love the corlor of the lamp base also! Love this!!! I need to get my hands on a cute base and go for it:) Beautifully done my friend!! Super cute! And don't worry about the seven years. Decorating is never done! It looks beautiful, good job! And I died laughing when I read, "I’ve been working on re-vamping my master bedroom. So far, it has taken me 7 years. I should be done pretty soon." HAHAHA! I've been re-vamping my master bedroom as well…for about 6 years. Totally adorable. I love it! I love this, I am getting ready to make some changes in my bedroom, and I love this look. You did a wonderful job. Thanks for sharing all of your projects. I really enjoy seeing what you are doing. Thats a great idea!! I've been looking for new lamp shades, but this is so nice!! (and much cheaper!!) thanks for the idea! I LOVE it! What great texture! Thanks for the tutorial. I've been looking for a good way to make over my lampshades in the master and this may just be it. Since it takes so long, I have to wonder if it's worth it….I'm so lazy…But they're so pretty! Love this project! Your shade turned out beautiful! Love the texture! "so far it has taken 7 years"
Ha! That's me and my whole house. Are you ever really done? Even when you're done, there's still that little tweak that needs doing. One of the reasons why I've never posted "finished" pics of my kitchen reno that happened nearly 3 yrs ago. OMG Chris, this is super cute! Love this! I am here for the first time via Kristin's comment on her FB page. Lovely blog. It has taken me 3 years to even get the slightest idea of what to do with my bedroom. So it will probably take me 7 or more years to finish it, too. Now I don't feel so bad!Happy Monday! Oh that is sooo pretty! LOVE it! So Cool! Great job! I am inspired! Great idea!!!!!!!!!!!!!!! i love it!!!!!!!!! Too cool, actually love the color that the lamp is right now, but look forward to seeing it updated, too! Very cute! DO NOT touch the lamp, it's sooo pretty the way it is! I love, love that lamp base! The color is my favorite! I need one just like it for my room. Can you please tell me where you got it? Thank you! Another cute idea. I don't know if I'd have the patience to do it though. You always have such great ideas to share. I am hosting a giveaway party if you want to stop over! Love this! I need to do something with my lamps…soon! Would love for you to enter your greatness at my inspiring Thursday linky party and would love it if you added your parties thumbnail to my parties page. I love the base color! The shade looks great. Very neat idea. Its so funky! I have a lamp I have been thinking about redoing the shade. I will have to keep this one in mind. So cool! The shade looks awesome! I'm going to have to try the ruffle thing. But please!!! Don't change the color of the base. It's such a pretty blue! Don't do it! Turquoise lovers everywhere will weep! Wow! Amazing what some time, a glue gun and $2.99 can do. I love the texture this adds! A-M-A-Z-I-N-G!! I have an angled shade I wanted to do something with. I'll have to play with it and see if this technique would work. Thanks SO MUCH for the tips. I'm LOVING this! I've seen all over blog land this week and I want to make one sooo bad! Your poor fingers lol. I would be delighted if you would share this at my VIP party today as well. I absolutely love this! I am going to have to find a lampshade in my home that needs this. It's beautiful! And I completely understand as well about the burlap! I will itch for hours but it will be so worth it! Gorgeous! And I, too, love the color of the lamp base! This is gorgeous! For this, I would pick up an iron. I hate to iron! That is GORGEOUS! I love it. Found you viaThrifty Decor Chick. Very cute! 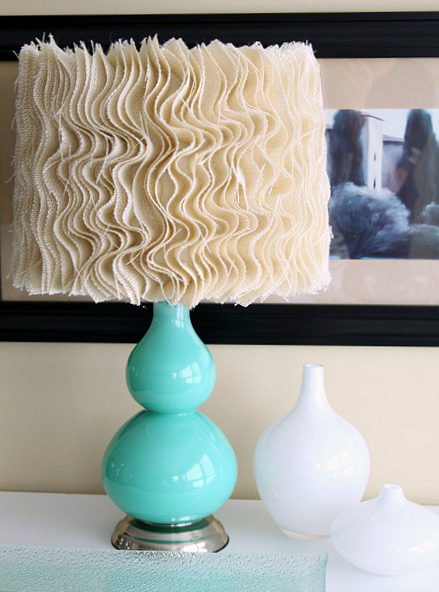 Love the color of the lamp with the texture of the shade. never seen anything like this – love it! that is gorgeous… I'm going to have to try this! Love the lamp and especially the shade! I'd love to try this because it is really unique! I featured your DIY on my blog. Loved your lamp so much (and Mama Says Sew!) that I painted mine! I was also going to try the lampshade, but not sure I need it anymore now that the lamps have some life! OOOHHHH!! This is amazing! Truly! I LOVE it!! What an inspiration! I am in desperate need of new lampshades! And I think I will look no further! Thank you! This looks fabulous! I will be doing the same thing to my daughters lamp in her room. I’m so glad, Melissa! It’s a fun shade, no? “So far, it has taken me 7 years. I should be done pretty soon. ” heehee… . ditto here. But I think I am finally getting somewhere with my living room. I am working on a photo gallery wall right now but as soon as that is finished I have two lamp shades that are going to look similar to this. 🙂 Thanks for the inspiration! Yes, indeed, so much inspiration in blogland!!! Thanks for sharing. Found your lampshade on pinterest..love it!! Was curious where you got the burlap, since it doesn’t look loike the normal burlap where I live ( brown and too loose & rough). Yours seems more the linen like burlap. Great question, Grace. It is in fact the ol’ “regular” burlap. However, I think I found this either at Hobby Lobby or JoAnn’s. It is a lighter shade of it, but it’s still just burlap. Thank you for stopping by! Great Job Chris…I am still chuckling to myself…you have a great sense of humor. Hey Chris. I love your blog and that lamp colour is just beautiful. i’ll be doing this pronto. Can’t wait to do this, thanks for the great pictures. I also really like the lamp base Correction, I LOVE the lamp base! Love this! I love the lamp base too! I see it’s from awhile back, but where in the world did you get that from?!?! It’s beautiful!! I am playing on making this for my room but I need a lamp to do it! Where did you get your lamp???? I just looove it but I cant find it anywhere! If anyone can tell me where to find it, it would be a huge help! Thanks! Hi Kenzie! I found it at Marshals last summer. Good luck!! I’m just curious, if anyone knows the answer. When you use glue sticks on a lamp shade, will it not come loose when the light has been on for a while and it gets hot? I’ve glued numerous lampshades, Kathy, and they’ve never melted. Perhaps it just doesn’t get hot enough for it? Just thought I’d let you know! And that’s exactly why I love blogging! While you might not use the exact idea, it gives you a jumping board for something else! Thank you!